These are Corvette offerings in EnerSys' Odyssey line: the Group 78 (left) and the Group 75. My interest in Odyssey Batteries was prompted by two battery failures in different Corvettes within a few months of each other. In the past I'd used Delcos and Optimas but I feel the quality of Delco batteries slipped since GM outsourced their manufacturing and I found the Optima to be overrated, so I researched alternatives which would perform better and last longer. The battery in my '95 Coupe was a "seven-year" Delco which lasted, well-seven years. Can't complain about that, but it had been made back when GM still made Delcos in its own battery plants. Today, I'm not confident that consumer Delcos are as good as they were back then. My '95 has high-output headlamps and some two-way radio equipment installed, so I wanted a replacement better than an OE-type battery. 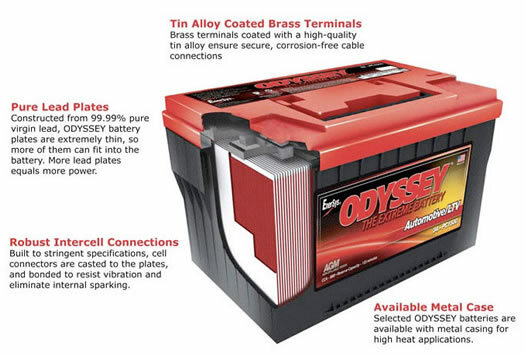 I'd heard about the Odyssey Battery from a friend of mine, Bill Boudreau, who runs "ZR51 Performance", Corvette service business in Phoenix, Arizona. After listening to Bill's Odyssey accolades and researching the product on the Internet, I acquired an Odyssey Battery, model 75 PC1230 to try in the C4. Group 75 batteries have the side-terminals used in Corvettes from 1969 to 2003. This is the Odyssey 75 PC1230 in an '89 C4. That Odyssey fits all 84-96 Corvettes including the 2G ZR-1 without modifications. The battery in my '71 failing was irritating because it was an Optima Red Top I'd installed only 18 months before. The Delco I'd had in the car before that started giving me trouble. Thinking Delcos weren't the quality benchmarks they once were and because of Optima's excellent marketing, I tried a Red Top. My assumption was its extra cost would buy me better reliability along with increased tolerance of the occasional deep cycles typical of hot rods which get parked or stored for long periods. 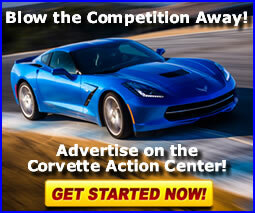 While the Red Top is popular with Corvette enthusiasts, because of its short service life; I was disappointed. The first six months were great, but then, the car sat about three months and the battery went dead. I charged it and it was fine while I drove the car for several weeks. Then, there was another period of storage, but this time I disconnected the battery. Optima's technical information states, "Depending on storage temperature, the Optima can sit for 8 to 12 months and start most vehicles." In my case after, six months, even left disconnected, the battery was dead, again. No matter what I did, this time, it would not accept a charge. By then, I'd been running an Odyssey in my '95 for several months and, up to then, it had proven a good choice so, I ordered another. This time, because of the car's highly-modified 460-cuin. big-block and it's high cranking load, I selected the larger, 78 PC1500, about the biggest battery which fits in a C3 battery box. The larger, 78 PC1500 is the ultimate battery for a C3 Vette. It's about the biggest battery which fits in the stock battery mounting. This battery is ideal for starting, big-blocks modified with higher compression and higher valve spring pressure. Made by EnerSys Energy Products in Missouri, Odysseys are popular with en-thusiasts willing to pay extra for a battery with deep discharge ability, high "pulse cranking" power, good reliability and long service life. Admittedly, they are expensive, but a good value to those looking for such a battery because their performance and durability beats many products of comparable size and CCA rating on the market, today. They are perfect for high-performance street and racing engines which tend to have higher cranking loads because it can provide five-second cranking pulses at current flow far higher than its CCA rating and more than the pulse rating of the same-sized conventional battery. In addition, Odysseys are excellent choices for cars with significant electrical loads, particularly from car audio or video equipment which may operated for long periods of time when the engine is not running. As for performance in cars which are parked or stored for long periods of time, EnerSys claims the Odyssey is capable of up to 400 charge/discharge cycles to an 80% "deep" discharge. 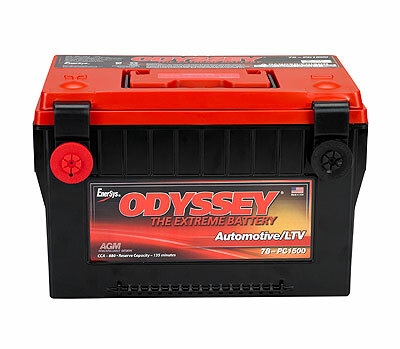 Both the Odyssey Battery and the Optima batteries employ absorbent glass matt (AGM) technology to contain acid, allowing the battery to be installed even on its side. But the densely packed flat plates in an Odyssey avoid the "dead space" between the cylinders in a "six-pack" Optima battery. The result is 15% more plate surface area and that results in more starting power. One reason Odysseys perform well is flat plates made of pure lead rather than lead alloy. Pure lead plates can be made thinner, so more fit into the battery. More plates mean more surface area and that means more power. Robust construction, absorbent glass mat (AGM) design, vibration-resistant, welded internal connections and tough, corrosion-resistant, tin-plated brass terminals all give the Odyssey, according to Enersys, a 3-10 year service life. The AGM design prevents spills, even when installed on its side. Unlike many conventional batteries, Odysseys can be stored for up to two years and still be returned to full power. The Odyssey which fits many Corvettes after 1968 is 75 PC1230. It's rated 730 cold cranking amps (30-sec. at 0°F) and an astonishing 1230 "starting pulse" amps (5-sec. at 68°F). About the only downside is it weighs about 10 lbs more than most batteries people put in Vettes. As good as Odysseys are, they can't violate the laws of physics. Those extra lead plates add weight. The 78 PC1500, which I put in my '71 big-block hot rod, is rated 880 CCA and 1500 starting pulse amps. Like the 1230, it's a heavyweight at 49.5-lbs or about 15-lbs more than the regular battery for a '71. Here is the big-dog PC1500 before we stuck it in my 460-cuin, hot rod 71 Coupe. The upside is this battery's phenomenally cranking pulse current flow and it's durability. The downside is that it's a heavy sucker at 49-lbs but, with a street-driven hot rod, we'll take the extra starting power in exchange for the weight. 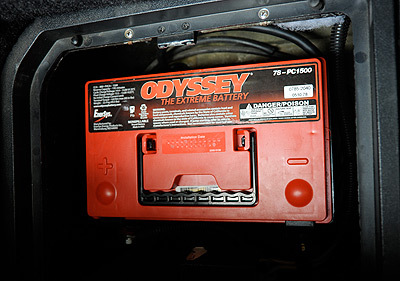 While I tested an Odyssey, in my '95 and my '71, I found that it, also, fits the battery mounts in the 80-82 cars. Today, the normal replacement for late C3 batteries is a Group 70 but those cars originally called for a smaller, Group 73 or 71 battery, both of which are expensive and hard to find. Though GM went to small batteries 80-82 in the interests of reduced weight, it turns out that the battery mounting in all C3s is about the same size, so to upgrade a late C3 to a Group 75 Odyssey is as easy as lifting out the older, smaller battery and dropping in the new, larger unit. 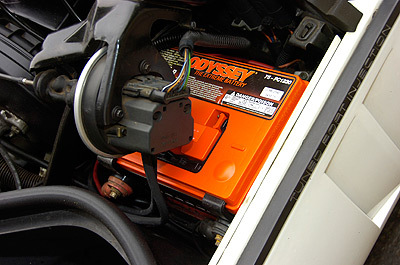 This is the Odyssey PC1230 in the battery box of an '82. The Group 75 Odyssey is quite a bit larger than the OE battery size for 80-82 but, the battery box in a late C3 is the same size as the older models, so battery upgrades are not a problem. The 75 PC1230 fits C3 from '69-'82, whether the stock battery was a Group 71, 73 or 75 and its CCA rating exceeds that of the OE battery in any of those model years. In addition, there's an Odyssey for Vettes from '68 all the way back to '57, all of which used a top terminal Group 24 unit. Actually, there are two Odysseys you can use for pre-'69, either the PC1200 or the 34 PC1500, the latter being a more powerful choice for a high-compression engine or a custom car with a lot of audio equipment. As for how the Odysseys work in my two Vettes, I noted with both cars, a slight increase in cranking speed during cold starts. The next subjective test I did was let both cars sit for two weeks without their usual Battery Extenders ("smart" trickle chargers made by Auto Meter), being connected. In both cases, cranking speeds were a little faster than they were under the same conditions when each car had its previous battery installed. At same the time I went to an Odyssey in my '95, I also put one in my Blazer. That truck sits outside for months, gets used on a weekend outing and then sits for months again. I needed a battery which could sustain a tiny discharge for long periods, then fire the engine. In three years of doing that, so far; the Odyssey has started every time. Additionally, since I take the Blazer to west-central Wyoming once-a-year, during the winter, I've had some experience with very cold weather starts. Even at -20°F, the Odyssey cranked that engine almost as fast as it does in warm weather. 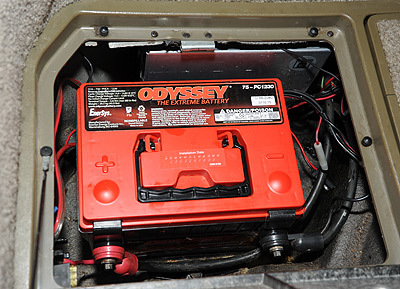 Bottom line: so far, Odyssey batteries are working quite well in three different Vettes I either own or maintain. I have a fourth in the Blazer and a fifth one in my '01 Camaro. The Odyssey is now my "battery-of-choice".